The best innovations are often the simplest. 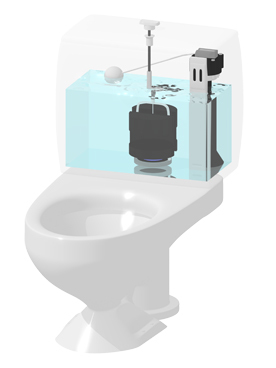 Flush guard turns old water-wasting toilets into efficient dual flush toilets, providing a fast an inexpensive solution. In as little as 15 minutes your old toilet is transformed into a modern dual flush toilet. With Flush Guard small flushes consume just a few litres of water, while big flushes use the original amount of water. This ensures that the toilet and sewage system work perfectly together. Flush Guard improves the flushing power of old toilets significantly. The toilet bowl is rinsed with higher pressure, so the result is more hygienic and the water in the tank is completely replaced. Flush Guard is an extremely cost-effective solution. Since old toilets do not need to be replaced, there is no need to invest in expensive new toilets, saving your building a lot of money. Flush Guard is also an eco-friendly solution, providing a model example of sustainable development: “If it works, don’t replace it”. Old toilets represent undesirable environmental waste when disposed off in landfills. They can last hundreds of years and cannot be recycled or reused. Installing Flush Guard poses no inconvenience or water cuts for residents and takes just a quarter of an hour. At the same time we will inspect all the toilet’s seals. The installation is tidy, and most importantly the first impressions are a positive surprise. Existing toilets that are modernised using Flush Guard have quieter yet more powerful flushes. According to statistics, the average person uses six small flushes and one big flush a day. Accordingly, a family of four using a traditional single flush toilet with a capacity of six litres would use 168 litres a day when flushing. Flush guard reduces water consumption by almost a half, saving the family 72 litres a day and 26,280 litres a year. At the same time, Flush Guard provides stronger yet quieter flushes while reducing the amount of waste water. Flush Guard functions as precisely as a clock. Use your toilet just like before and Flush Guard takes care of the rest. Small flush: Press button for 1 second = half flush. Big flush: Press button for 3 second = full flush. Note: For toilets with pull-knobs, pull the knob for the same amount of time. Toilets modernised with Flush Guard have a sticker with clear instructions, so even children and old people understand how it works. The sticker also shows that the toilet has been modernised with Flush Guard. Flush guard can be installed in all normal single function toilets used in Finland. The system is reliable and maintenance free, as there are no parts that can wear or need to be replaced. Flush guard is also fully compatible with the sewage systems in older buildings. Flush guard is made from durable polypropylene that repels impurities. 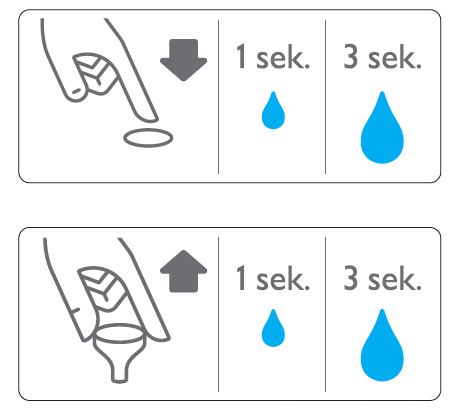 In tests performed by the VTT Technical Research Centre of Finland back in 1999, Flush Guard’s half-flush function was shown to be more efficient than the half-flush function on new toilets. No wonder that almost 200,000 Flush Guards have already been installed in Finland to reduce water consumption!